A contrasting hole here, made difficult for the men being 175 yards from the back tees generally into the wind and onto an elevated green. For the ladies however it is just 110 yards and a relatively straightforward tee shot. Bunkers on the front left and right of the green are to be avoided but frequently claim the drifting drive. 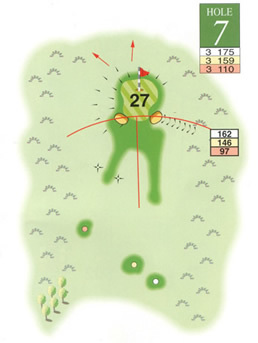 It is though quite usual to see the ball roll right or left on landing as the surface contains some interesting nuances and putting back down the sloping green can easily convert a birdie opportunity into a frustrating bogey.